Today’s post is about investment clubs. 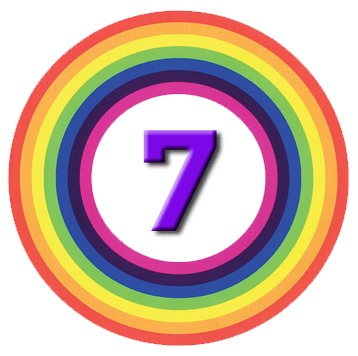 Is it worth joining one, or even starting one? Are they legal? An article in the Telegraph last week caught my eye. It was about the rising numbers of “confident DIY investors”1 who are also managing the investments of their partners, relatives, friends and neighbours. Platforms like Hargreaves Lansdown and YouInvest let you manage other people’s accounts on their behalf. Some even offer discounted fees based on the total amount invested across all linked accounts. He’s a retired IT guy with no financial qualifications. He follows strict rules, using funds only and a maximum of twelve investments at one time. By using the same funds for everyone he ensures that when his friends and family lose money, he has lost money, too. He also insists on ISA and SIPP investments, to use up allowances. This approach will obviously ring alarm bells with many, so it’s worth pointing out that the primary protection is that each person’s account is linked only to their own bank account. While you may be able to set up permissions to allow someone else to trade on your behalf, they can’t take money out of (or put money into) the account. most people trust someone the know more than they trust a stranger, even if the stranger is well-qualified. The Telegraph also thinks that the 2015 Pension Freedoms are a factor, since more people now need to keep money invested in retirement as part of drawdown, rather than buying an annuity. And if you die before age 75, your pension can now be passed on tax free. The motivation for John is less clear. It’s a lot of work for no pay, though at least he keeps things simple by using the same investments for everyone. 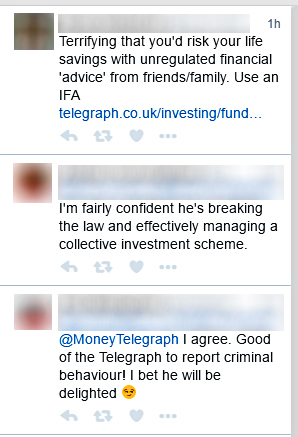 The reaction from IFAs on Twitter was predictably hysterical. They thought this was “terrifying” and worried about “unregulated advice”, “collective investment schemes”, “breaking the law” and “criminal behaviour”. Of course, since linked accounts could cost them money, they would say that, wouldn’t they. 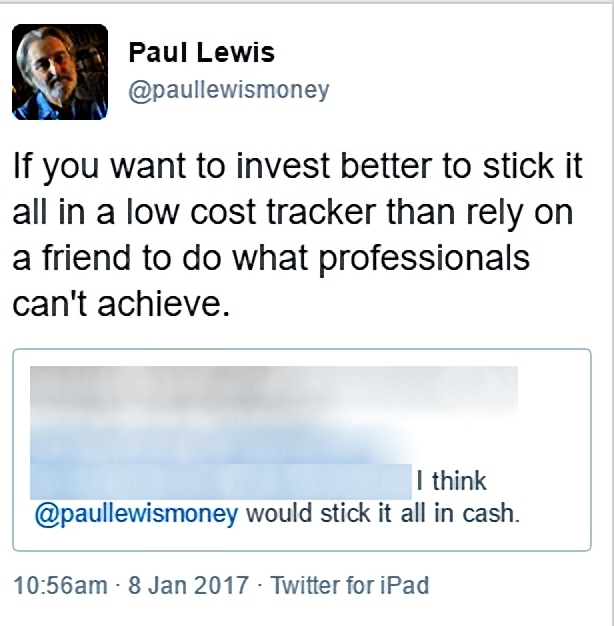 Of course, Paul usually says that cash is best, so this is a step in the right direction. Before we get started on this, let me point out that I am not a lawyer3 and you should do your own research (DYOR). The IFAs aren’t correct, of course. What are the odds that respectable firms like Hargreaves Lansdown and AJ Bell set up these linking schemes without thinking about whether they were illegal? The first thing to cover is (unregulated) collective investment schemes (UCIS). These are pooled investments that aren’t authorised by the Financial Conduct Authority (FCA). That means that you generally don’t have access to the Financial Ombudsman Service or Financial Services Compensation Scheme (FSCS) if things go wrong. Linked accounts aren’t regulated by the FCA (in the sense that they are run by a person who isn’t regulated) but neither are they pooled investments. Each person has their own account, which can be invested separately. The restriction is that they can’t be promoted to the general public. So it’s unlikely that John is breaking the UCIS rules when one of his friends or neighbours finds out about his offer. And even if he was, they could get around it by everyone declaring themselves to be sophisticated investors. This waives your rights to compensation if you make a loss. You’re effectively saying that you know what you are doing. More importantly, John isn’t getting paid, so the restrictions on promotion don’t apply. Unregulated advice isn’t illegal, either. The only restriction is that they aren’t allowed to charge you money for the advice. You can’t run an investment advice business without passing the relevant exams (and paying the relevant annual fees to the FCA). It’s worth pausing here for a moment to consider the difference between financial guidance and financial advice. There’s a Treasury consultation at the moment around amending the definition of financial advice, in order to clarify the distinction between it and financial guidance. The government is worried that the broad definition of advice discourages people and organisations from providing guidance. This limits public access to information that would help in making financial decisions. The RDR has meant that true, personalised financial advice is now too expensive for most people, and so the availability of guidance is even more important. At the highest possible level, advice is personal, and regulated. Advisors need to know their customer, and understand their needs. Guidance is not personal, and closer to education about financial issues and products in general. The more established form of amateur cooperative investing in the UK is the Investment club. These have been around for decades, though I believe that their numbers are dwindling. Members each contribute a monthly sum which goes towards collective investments. Usually no money changes hands directly between members, other than to cover expenses. For the purposes of this discussion, we’ll assume that the investments are shares and funds (eg. ETFs) rather than anything more complicated like CFDs and spread bets. Similarly, private equity or angel investing will be excluded. We’ll also assume that the members of the club are acting as individuals, and that the club is not incorporated as a limited company or a partnership. Some clubs have advisory accounts with their brokers (which may well be against the law) but the majority have an execution-only broker. Investment decisions are made within the group, usually after general discussion and voting. So there is probably advice being given, though usually this is in multiple directions. The big question is whether all of this is legal. The situation would be even more complicated where a member of the club is authorised to give advice as part of his day job, and yet more complicated if his firm were the club’s broker. This is fairly unlikely, and we’ll ignore it for now. Where a single member – or a subset of members -leads the club, he will also be “managing investments” and “operating a collective investment scheme”. It ought to be possible to overcome these obstacles through democratic voting, even if one member makes all the proposals. The first point to make is that investment clubs don’t have any specific legal exemption. HMRC publishes rules on the tax treatment of income, profits and losses, but the clubs operate under the standard rules about investment. Things are often forbidden unless there is an exemption. The key prohibition says that “regulated activity” can only be carried on “by way of business” if a person is (a) authorised or (b) exempt. The activity itself needs to relate to investments or to property. It’s very likely that anyone not receiving remuneration for providing advice would not be held to be carrying on this regulated activity as a business. It’s pretty clear that what John from the Telegraph is doing is legal, despite the Twitter protests from IFAs worried about the threat to their closed shop. Linked accounts aren’t a collective investment since the money isn’t pooled. Collective investments aren’t illegal, only their promotion to the general public is. Unregulated advice isn’t illegal either – only getting paid for it is. It’s also likely that the platforms took legal advice before setting up linked accounts. Most importantly, John isn’t being paid to manage his friends’ and neighbour’s investments. The same protection applies to members of investment clubs. The research has piqued my interest about amateur collecting investing. I’ll be back next week with some ideas on the practicalities of investment clubs in the internet age. Today's post is about family firms, which can make very good investments.